Collage is the primary medium of my work. I am interested in pattern, texture and the messages conveyed by the combination of text and image. The primary source materials used in this body of work are: fragments of maps, notes, cancelled stamps, old books, and scraps of paper with handwritten notes or maps. This work is an investigation of memory, nostalgia, time and space. Home and space become synonymous with memory, loss, and nostalgia. 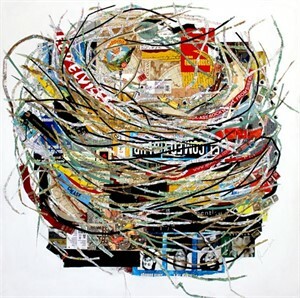 Some of the pieces retain the overall image of a bird’s nest and these pieces relate to a specific moment in time and contain material specific to that time such as product labels, canceled stamps, receipts, letters, notes, exhibit entry stubs, packaging material and a variety of printed matter. 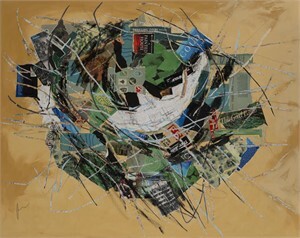 Some of the work specifically considers the circle as the primary subject. Other pieces are a pure abstract use of found materials considering the material as subject. The works that use the image of the nest contain all of the elements of texture, shape, and found elements. I actually collect the physical nests and refer to them while working. I see this as part of the process and am working on sculptural versions of the 2D collages. All of the work is structurally dense, complex and is an autobiographic statement. In particular, I find that monetary exchange, food, entertainment, and work; those things that seem so precious at one moment can be so insignificant later. All is really kitsch. Collage is the primary medium of my work. I am interested in pattern, texture and the messages conveyed by the combination of text and image. The primary source materials used in this body of work are: fragments of maps, notes, cancelled stamps, old books, and scraps of paper with handwritten notes or maps. This work is an investigation of memory, nostalgia, time and space. Home and space become synonymous with memory, loss, and nostalgia. 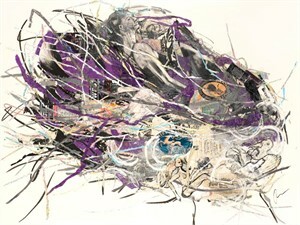 Some of the pieces retain the overall image of a bird’s nest and these pieces relate to a specific moment in time and contain material specific to that time such as product labels, canceled stamps, receipts, letters, notes, exhibit entry stubs, packaging material and a variety of printed matter. 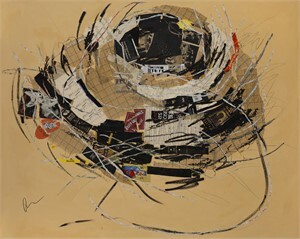 Some of the work specifically considers the circle as the primary subject. Other pieces are a pure abstract use of found materials considering the material as subject. 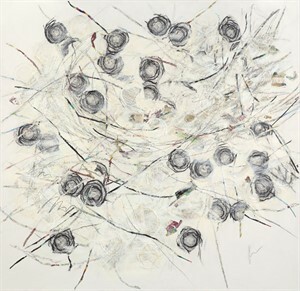 The works that use the image of the nest contain all of the elements of texture, shape, and found elements. I actually collect the physical nests and refer to them while working. I see this as part of the process and am working on sculptural versions of the 2D collages. All of the work is structurally dense, complex and is an autobiographic statement. In particular, I find that monetary exchange, food, entertainment, and work; those things that seem so precious at one moment can be so insignificant later. All is really kitsch.